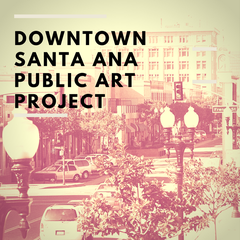 The City of Santa Ana is seeking qualified artist(s) or artist team to create eight panels of artwork in the City’s historic downtown at East 3rd and North Bush Streets. The artwork will be displayed on the building’s exterior walls of the new public restroom for visitors to the downtown area. The City has installed eight metal panels to display the artwork. There will be an initial review by a panel. The artists selected from the initial review will then be invited to present renderings and detailed work proposals, including project timelines, and a budget for further review by the Arts and Culture Commission. The selected artist(s) will receive a grant to assist with project-related expenses, such as supplies, materials, liability insurance, and artist’s fees. The artwork will be transferred onto vinyl wraps and then mounted onto the existing metal panels at the installation site. Applications are due on the Submittable website by Monday, May 1, 2017 at 4 P.M. The online application will prompt you to submit the information directly into the fields and to upload submission materials. Please check the timeline on our website for any changes prior to attending the Information Sessions, City Council and Arts and Culture Commission.